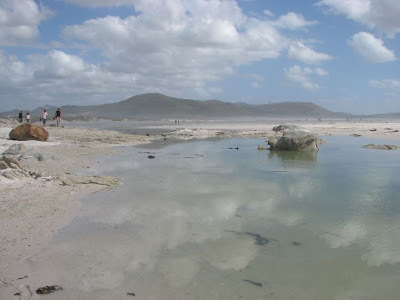 Regular readers of the blog will know that we frequently visit Noordhoek Beach, which is a wonderful place to walk the dog and get some interesting photographs. 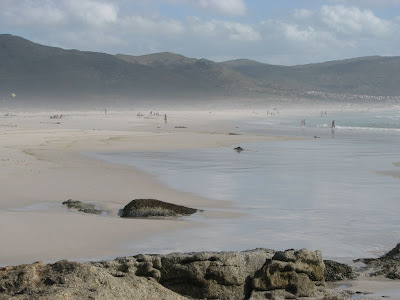 A while ago, planning a family celebration, we thought of going to Noordhoek. Living in Cape Town we have a huge choice of Restaurants. Deciding where to go can be a problem. There are so many options. We often refer to Rousseau’s Restaurant guide, which we have found to be useful and reliable. The guide listed only two restaurants in Noordhoek, neither of which appealed as we wanted somewhere that took advantage of the spectacular surroundings. On previous visits we had seen the Monkey Valley Resort sign but had never been there. Their website listed a restaurant on the premises so we decided to give it a try. The views and atmosphere are breathtakingly beautiful and did not disappoint. You approach the resort via a narrow road under a canopy of Milkwood trees. From the Restaurant you have a magnificent view over wooded slopes to the sweeping, white sands of Long Beach and the blue Atlantic Ocean. Weather-wise, it was a foul day, so once again not many pictures were taken but these, taken on a previous visit, will give a good idea of what the beach looks like. The meal started off well with a pizza starter, which we shared and thoroughly enjoyed. The main course was a disaster!!! One plate had to be returned due to the rice being a hard, dried out, cold mass that would probably have bounced if dropped. The replacement plate arrived when the rest of us were well into our meal. Our second bottle of wine had to be rejected, as it was corked and undrinkable, although this was probably not their fault. The cherry on the top was when we ordered two Kahlua Dom Pedro’s, a Cointreau, and a Port. For the first time ever a Port Dom Pedro was delivered to the table in a long glass! I had a taste and it tasted like a slightly fruity milkshake. Overall, our opinion of Thorfynn's Restaurant at Monkey valley must be, “very mediocre”. Unless you are having pizza we recommended that you give it a miss. What a waste of a very beautiful venue! Why can’t owners train their staff properly? It was an embarrassment to take guests there! We will not be back!!! We went on to take try and take some photos in Kommetjie but with such a huge wind blowing even the seagulls were having a hard time and it was not a very successful outing!